Arianespace’s sixth heavy-lift mission of 2014 has been given the go-ahead for Thursday’s liftoff from the Spaceport on a dual-passenger Ariane 5 flight carrying the DIRECTV-14 and GSAT-16 satellites. The approval was provided today at completion of the launch readiness review, which is held prior to every Arianespace mission to validate the readiness of Ariane 5 with its two payloads, as well as the Spaceport’s status and the tracking stations downrange. This clears the Ariane 5 for its transfer tomorrow from the Spaceport’s Final Assembly Building to the ELA-3 launch zone, where the final countdown will begin. Scheduled for liftoff during a 1-hr., 10-min. launch window that opens at 5:38 p.m. local time on December 4 in French Guiana, the two spacecraft will be deployed during a flight lasting approximately 32 minutes. Payload lift performance for Ariane 5 is more than 10,200 kg., which includes a combined total of some 9,480 kg. for the DIRECTV-14 and GSAT-16 passengers, plus the launch vehicle’s dual-passenger dispenser system and satellite integration hardware. 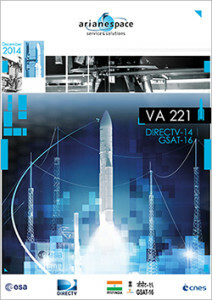 DIRECTV-14 is installed in the upper payload position on Ariane 5, and is the larger of this mission’s two passengers. 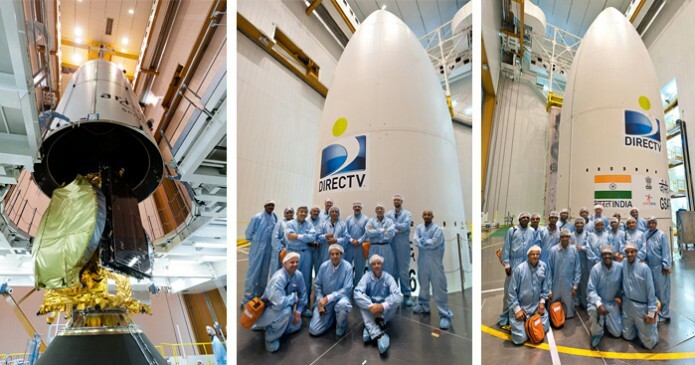 As a 20-kilowatt class Ka-band and reverse-band digital broadcast satellite built by SSL (Space Systems/Loral), it will deliver Ultra HD and other new consumer services for DIRECTV. Located in the launcher’s lower payload slot, GSAT-16 was developed by the Indian Space Research Organisation (ISRO), and carries Ku- and C-band transponders to further augment communication services across India. Thursday’s Ariane 5 mission is designated Flight VA221 in Arianespace’s launcher system numbering system, signifying the 221st liftoff of an Ariane family vehicle from the Spaceport in French Guiana.